OOH No we don’t ! Our esteemed Taoiseach Leo Varadklar has put his foot in it, by saying on an interview with BBC spotlight that more than 50%+1 wouldn’t be sufficient for there to be an United Ireland and consensus (general agreement according to Google) would be required, Now hold on a minute here when was “consensus” ever required when it came to the north… In the never never more like. Making up my mind on our present taoiseach but its clear he is a blue-shirt of the first order, he is half Indian which means he should know better to come out with this pseudo-unionism. 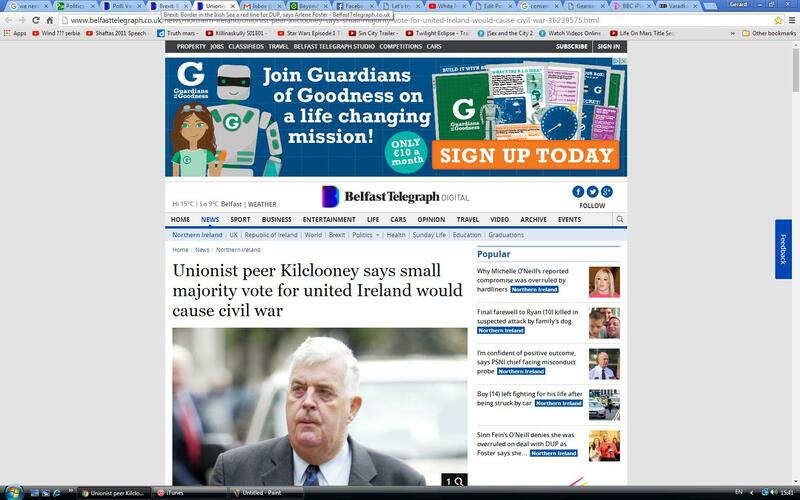 Lord Kilclooney aka John Taylor of the “moderate” OUP thanked Leo Varadkar for his “realism”, no thank his blue-shirt. The loyalists are full of threats of course but like all bullies don’t amount to much when they are stood up to. One thing they never was a unionist majority in Ireland, Donegal remains the most northern county in Ireland and Donegal, Cavan and Monaghan are part of ulster too but where excluded from “Northern Ireland” for the simple reason they would be too many Catholics. Irish people as a whole were never consulted whether they wanted a border or not it was just forced on them. However one loyalist politician I do agree with is Nelson McCausland when he says that the taoiseach’s comments are “a recognition that the main political parties in the Irish Republic have no real interest in Irish unity“. Fianna fail and fine gael have little interest in uniting Ireland or providing jobs for their people, they feel they have a god given right to scams and want nothing to rock the boat. Previous Previous post: Why Britain can Lose Northern Ireland. Next Next post: Need I say more.